I simply adore Jenna and Matt & am so grateful to have had the chance to capture their summer engagement session last month at the New Jersey Botanical Gardens in Ringwood, New Jersey. We took advantage of the beautiful morning light, the stunning gardens and landscape & the quietness of this location that only happens during the week. Jenna and Matt were playful, loving and up for anything! Jenna looked gorgeous in her cream colored dress and I like how Matt opted for a relaxed look. Everything about their session was fun yet romantic and I loved creating new memories for them in a location that they found special. I can’t wait to capture their wedding next May! 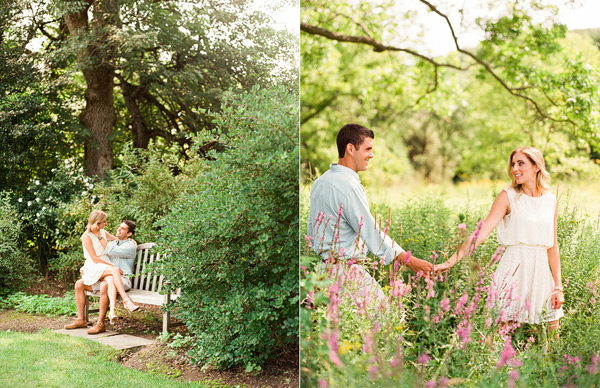 Love the tones in these images, the colors are so pretty! Beautiful photos! Such a sweet couple! Great images! Love this! what a beautiful couple! love how simple and pretty the images are! Beautiful, Lindsay! Love those flowers in the field! Oh my, absolutely love this session!! What a seriously stunning couple, they are beautiful, and your images are gorgeous as always. I especially love your black & whites here! Beautiful images! Which part of the botanical gardens could I find the field with pink flowers? So lovely.